Bailey is one of our barn superstars. As steady as they come, she excels at teaching riders new skills. Roxy is an Appendix Quarter Horse Mare. She has an extensive background and is quite skilled at teaching a rider the right way to do things. 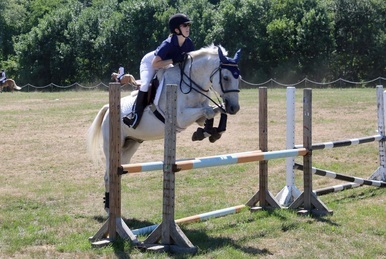 She has attended many jumper shows as well as multiple Pony Club rallies. Mira is a Welsh Pony cross mare. Eager and willing, Mira will take the smaller rider around a jump course like a pro. A more forward ride than some other school horses, Mira is a great match for enthusiastic kids looking to do a little more. Belle is a chestnut Appendix mare. Belle is a kind girl who will quietly trot a cross-rails course with a novice rider or help a more advanced rider learn how to ride effectively. Her sweet personality is quickly making her a barn favorite! Trouble is a Morgan gelding owned by Kerrie. Soft and responsive, he is a great ride for intermediate and advanced riders. Shovel is a 15 h grey Welsh cross gelding. 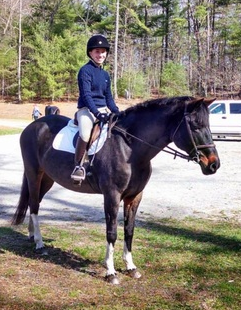 An experienced eventer, Shovel is a great partner to show a newer event rider the ropes. Shovel is for lease only. Downy is a bay Thoroughbred gelding. 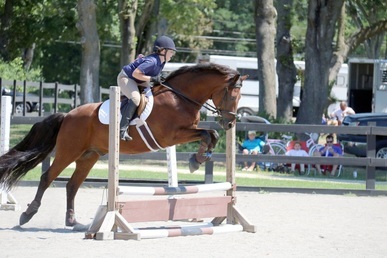 An experienced show jumper, Downy is a forward and eager ride for an advanced rider. He also loves to go cross country!